Fairytales and Fitness: When is it JUST a Run? Throughout the years many races have added challenges with additional distances throughout the weekend. Since this has become very popular, I feel like we have downgraded our accomplishments. Take for instance the Goofy or the Dopey challenge at Disney. If you are not taking a part in a challenge, it is so common for someone to say, “ I am running JUST the marathon”. Since when does the word “just” come in front of the word marathon? Do you feel like your trainer runs are unworthy of an accomplishment? Or is it “just” about the bling to show proof of your accomplishments at races? No run is every "just" a run for me, as it's always a challenge. I think it always will be too. And that is totally fine. We have to appreciate every mile completed. The fact that after two knee surgeries I can still get out there and put one foot in front of the other, makes every run more than just a "just"! Wow! That is something. Kudos for you! Haha! I've been running "just" 3 miles at a time and def have caught myself saying that. But there was a time when running 3 straight miles without stopping was a big deal in my world. I need to remember this! Yes, all miles mean different things for runners. I think at some point distances that seem so daunting in the beginning become easy or routine, and that is when "just" prefaces them. Which isn't necessarily a bad thing. 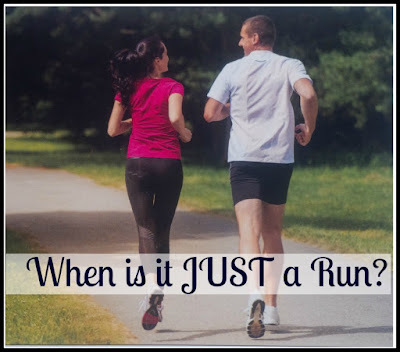 I think the increasing participation in running challenges has led to so many people adding the word "just" in front of their races or training runs. The fact that you're getting out there and running at all is an accomplishment worth celebrating. i've caught myself saying "oh, i only did 4 (or 6, or whatever it was) miles today," and then wanting to eat those words, esp if i'm talking to friends who are amazed when anyone can run over 2-3 miles at all. i never want to come across as someone with a chip on my shoulder about running -- the truth is that we all struggle to achieve those miles and sweat out the difficulties and push ourselves when it's hard, and no run is ever so insignificant to justify as "just" in front of it if we pushed ourselves and fought for those steps. So true. Every run is an accomplishment. No matter how long it is. I used to catch myself doing this a lot, and I think it's quite common. I agree though, every mile is an accomplishment!! I am guilty at this as well. LOL I loved how you ended that story - too cute!! With all these challenges now it's hard not to use the woRd "just" especially if you are not completing the whole thing. Ha! I think about this all time. It's easy to get wrapped up in comparing yourself to, well, yourself, but it's all relative - to a beginning runner "just" might not even be a thing! I never thought of that when I do tell others how far I ran. But you have a good point. If they don't run or are just starting to they would never use that word. That's such a good point. That word "Just" takes away so much of the work you are STILL doing. But I do hear it used more & more. I catch myself all the time saying "Just" a 5k when my friend did her first & she was so excited with herself. That's when it hit me that it isn't JUST anything when you do any sort of run. To some, its something they never thought they'd do. I have to keep reminding myself of that too. My best friend just completed her first 5k this year after losing 66 lbs. To her that was a a big accomplishment. And so it should be. Amen. Ask anyone who has been injured--there is no such thing as just a run. Whenever my husband says that (in deference to me) I remind him of the differences in my lifting. Be proud of any and all miles! Everyone should be proud. No run is effortless. This sounds like the conversation I "just" (lol!) had with a friend. We were talking running and athletic events and she said "I have to take the word 'just' out of my vocabulary". She was referring to a conversation she'd had with a friend who was going to do half ironman, and my friend told her "well, I'm 'just' doing a duathlon". We talked about how we measure things and that a du or a half isn't "just" that. It IS, and we should be proud of it no matter what we do. I have caught myself saying that before when I run 3-4 miles. I think it depends on who I am talking to. Yes I agree. It does depend on that. People I work with think that may be alot. But my friend training for the marathon thinks that is nothing. Ja ja! I used to do this, then my sister got annoyed with me and said "Stop saying 'just' right before you say the number of miles, it's annoying! say the number of miles and shut up. Most of us haven't walked that in one week, there is nothing 'JUST' about it!" My sister keeps me real! My sister says the same thing....haha. Man, I've reflected on this SO much lately. As I aim to get faster, I'm trying not to say "just" when talking about paces because I know some of my readers may now be running paces slower than mine. And I've tried not to say "just" about distances as I've decided to forgo a marathon this year and drop back to 5ks and 10ks. In general, I'm trying to remove the word just from my vocab! I know its so hard to do. Especially when you are talking to others. I hear ladies do this all the time in our running group. I personally feel the training is the hard part and the accomplishment more than the race. Wow, 25 miles a day, that is awesome. Good job. I am guilty. All runs are hard for different reasons. No such thing as "just"
I feel this way, too, especially at Disney race weekends with all of the challenges they do. For WDW marathon weekend, I'm "only" doing the 10K and Full. I think some of the challenges take away from actual race accomplishments. I don't think any run is a "just" run, and while I have done all the challenges you mentioned, they should not get any more running credibility. IMHO, it just means you trained hard (at least in our case) and we ran some pretty long mileage to get there. I do think it is a shame when people saying I'm just running the marathon!